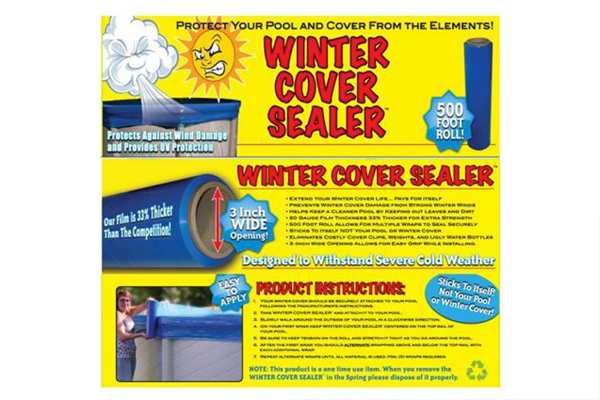 Close Your Pool Like A Pro With The Winter Cover Sealer! Winter Cover Sealer is the inexpensive product that provides peace of mind all winter long. Close your pool like the pros with this simple to use product that only takes minutes to install. After securing your winter cover, simply roll around the outside of the pool around the center of the top rail while keeping tension to provide the ultimate seal. There’s nothing more frustrating than taking the time to close your pool then have the cover fly off or fall in. With this unique sealer your cover will stay on tight in place.